This week on the Modern Customer Podcast we talk about all things mobile innovation. 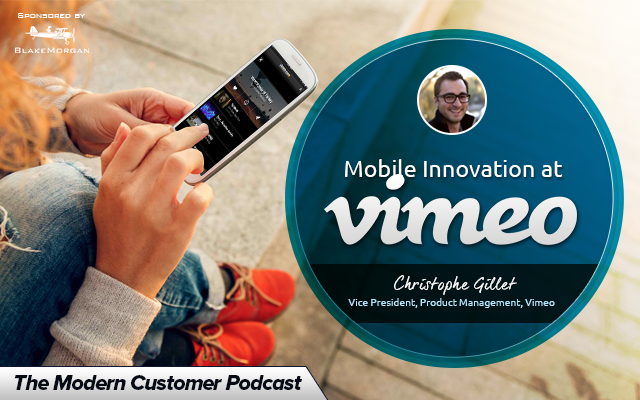 Our guest is Christophe Gillet, vice president of product at Vimeo. In this capacity, he leads the product vision for the brand, including oversight and ongoing development for Vimeo’s creator platform tools and overall viewing experience. Under his leadership, the team has introduced new subscription tools for creators selling on Vimeo On Demand, rebuilt Vimeo’s search functionality and made significant updates to Vimeo’s suite of mobile and connected TV apps. Christophe joined Vimeo in 2014 from Adap.TV, which was acquired by AOL in 2013, where he launched and led product for their programmatic linear video advertising platform. Christophe has also held product positions at Ebay, Vuze, and Ipreo. He holds six patents across media and e-commerce, and was awarded the CES Innovation Award in 2012 for the Fan TV iPad app.